My life as a seller of vintage and retro everything and the inspirational joys I find in particularly Australian nature in and around my home on the outskirts of Sydney. This new market gave both sellers and buyers a fantastic day to remember. So many great things about it. I can only heap praise on the organiser--Jane. In her 20s and wow! what an entrepeneur and enterprising determined girl! Kind, helpful and friendly too --what more could you want in a market organiser. I have known her from other markets and fairs where she and her Mum and Dad run a successful business selling exquisite hand made fashion pieces, made of and with, vintage and antique Japanese kimonos. *upbeat music with a live DJ--great positive mood music --makes for less of those awkward quiet moments. Attracts and keeps the young (and young at heart) crowd who are into fashion and recycling probably more than the older generations. We were able to request songs as well, and were told to ask for the music to be turned down if too loud. *no entry fee--more important than many think. *regular visits by organisers to make sure all was ok.
*lots of bins--no need to go hunting and no problems with overfill. *eftpos facility--great for sellers who don't have a machine....and for buyers who may have run out of cash! *wonderful communication via email--so much attention to detail in there. *a very sweet gesture of a little pink paper bag with necessary info and survival chocolates waiting for us when we arrived at our stall. *and lastly.... obviously brilliant extensive advertising via the usual media channels and a facebook and blog site--the large turnup of sellers and buyers for a first time market showed us this. Many positive comments were given and heard so that is great. The other interesting aspect I saw was that the market was a mix of sellers--new items, upcoming designers, secondhand, vintage and retro. I think it worked well--people had a choice. Even though many wouldn't be seen dead in a 2nd hand item, and some vintage fans go completely nuts with purist era dressing right down to underpants, nowadays more and more want to use a mix of items to get the right look and save money, as well as think of the environment. Next market is in September--will keep you posted! I can't wait! The theme will be racing fashions! This photo shows the fantastic Miso Chic stall and a view of part of the market. Miso Chic sells pieces made from recycled vintage and antique kimono fabric. Their workmanship is perfection and their designs appealing and different but still very wearable. They have hairpieces, handbags, clothes, jewellery and more. This stall caught my eye with their snazzy handmade clothes full of amazing detail and pzazz. Redfox they call themselves. I took a business card but have promptly misplaced it. The two young girls were dressed totally cool. It seems they go places many others wouldn't. Imagination, style and talent is something they certainly have been abundantly rewarded with. It seems they use recycled clothing, and bits n pieces that others may not even think of. In this photo you can't see the jacket very well but it was incredible. It was completely sequinned and jewelled, with feathers and large military style buttons as added features. The crazy upturned lapels took the jacket to a whole other level. They also had extremely cute but funky dresses with hints of 70s prairie style, Alice in Wonderland and 80s glam. All were very wearable though, but such unique pieces you would be sure no one else would have. At $160 per dress and made to order I think that's more than worth it. This photo shows a rack I had for sale of retro 80s/90s beaded and velvet pieces. Velvet is becoming popular this winter with a comeback of new romantic and dandy styling--I don't think it's reached its popularity peak yet though--maybe next year. Guess who bought the beaded vest? Yes, the girls from Redfox! Here are my Doc Martens I had for sale. Docs are genius shoes in so many ways--they have an amazing history, are comfortable, long wearing, statement shoes and extremely versatile in how they can be worn. I love how a basic work shoe from the 40s can be turned into a rebellious shoe, then a forward fashion statement shoe. I also love how the company has not been backward in coming forward with a crazy variety of colours and designs. Look up their website--it has some great information worth knowing. 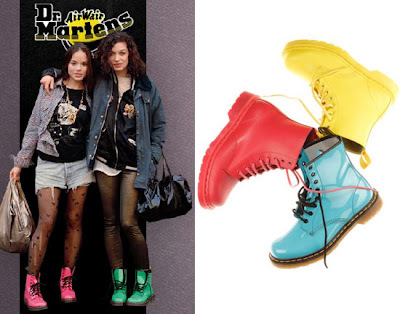 I sell my coloured docs for around the $200 mark and patterned ones for around 260. Basic black around 140 and those black and slate pebble pattern ones are $160. They may sound a little expensive but I am in no great hurry to sell them as I see them as investment pieces and am more than happy to have a collection of them. The Made in England ones are most highly desirable of course, as the new ones are made in China or Thailand. The quality whilst still great is just not quite the same as the older 80s/90s ones. So treasure your Docs if you have them. I don't think they will ever really go out of style and if they do you can be sure they will be back again. Today I've registered and booked to do the new Canberra vintage, and otherwise, fashion market called Fash 'n Treasure. What a great name! I wish I could think of great names like that. How often? : Every 2 months on the 3rd Saturday of the month. Sounds a great market even though I haven't been--however, their organised and savvy recruitment and advertising seems to not suggest anything else. And the venue is excellent--being as the name says--an old bus depot that has been revamped. Every Sunday there is a general market on there which is also fantastic. The theme is Formal Fashion--although as is often the case other items will be sold as well--but I will make sure I take some of the lovely formal outfits I have as well as some great warm and interesting winter coats and jumpers. Look out for some photos later in the week. Becky Sharp's Vanity Fair Vintage Fashion Market Leichhardt, Sydney, Australia. I am late in writing as my computer decided to give up the ghost so this is being put onto an old computer--not the same as a Mac but it seems to be working ok. So this market as mentioned is on the 2nd Saturday of every month and last Saturday was again a good roll up. It was cold with hints of rain but the good thing about this market is that it's under cover....in a great old Town Hall at that. It's so beautifully restored and painted that it adds greatly to the atmosphere of the market. This photo below is taken from the front of the hall. The next photo down shows the side street--where the entrance to the hall is. Lovely tree lined streets and bush plantings allow a fresh and clean ambience to Leichhardt even though it's in inner Sydney. Have a look at those lovely trunks on the Eucalypts. Of course it's also a mecca for Italian restaurant lovers and some great coffee shops, so you're never short of good food when you come to this market. I have found the Mezzapica cafe just 2 minutes walk from the Town Hall in Norton Street serves great coffee and food with the best service and great fun baristas. Here is a hint of what great clothing you might find at the market. This is from Grant's stall. He specialises in men's clothing and vintage style hand made jewellery. He has brilliant dress sense and used to be a window dresser in a past life so will help you choose very well. Oh god--that blue check jacket is incredible! Suzy is cool and fun. She sells amazing dress jewellery and a lot of it complements her own flamboyant character. One great thing about the market is many shoppers and sellers come dressed in vintage clothing, so you really feel like getting into it yourself. Not that you need to go all out --one statement piece can be all you need to stand out from the crowd. Suzy is wearing a fine black pleated dress with a 70s faux leopard print mid length coat. Her black ankle boots are her own from the 80s and she dressed them up by adding fur around the tops. "I can't sew, so I just glued it on" said Suzy! I think the fur on those boots is a great idea and completely balances the look. These shoes are from my men's selection. The grey 70s suede desert boots are in great condition. The blue "convict" boots are from Snoop Dog's range--not in production anymore, I believe. Those leather ankle boots sold to a young girl and the grey 80s smooth flat shoes looked very swank on the fellow who bought them--they are all the rage at the moment. I really don't know what to call them but they almost look like ballet shoes but lace up. There's also some brogues and 70s leather slip-ons. Vintage brogues have certainly taken off and look great on everyone I think. Teaming them with socks and shorts or a mini can give them a bit of an edge which is always good for something so traditional. Judy collects ties and has been on the hit ABC show the Collectors. I've forgotten how many ties she has but I know it's way many. So--yes, you guessed it--she specialises in selling ties as well, but also has a great range of menswear. Her knowledge of ties is extensive so you will find out everything you wanted to know about your tie purchase from Judy. Her display is always en-tie-cing as well. Gabriella always dresses immaculately mixing vintage with new. Her range of fashion items are also immaculately presented. She is wearing a navy blue 80s cropped military jacket with a wonderful feature high collar and gold buttons. Underneath is an 80s longline vest over a white shirt. They are accessorised with a gold belt, glam navy and gold cowboy boots and a slightly quirky off centre up-hairdo. Hope you enjoyed a bit of a look at this market--I might throw up some more photos of it another day soon. Even better--put it in your diary for next month for a great browse if nothing else. However, I don't think you'll walk away empty handed--there is so much tempting stuff for sale priced from $1 to hundreds! As a seller I rarely leave home without a purchase myself. Today I have been getting organised for the Vanity Fair Vintage Fashion Market in the Leichardt Town Hall, Sydney which is on tomorrow. It has been running since November 2008 every 2nd Saturday of the month from 10am-4pm, and has been a successful market which has seen many people come through the doors--from those seriously into vintage fashion who come dressed fully in the regalia of their chosen dream era, to those yearning for a touch of nostalgia to those who simply like to wear something different and use it as part of their creative urge. Seriously--you will never know what you might find at this market--it does not stop at clothing but there are shoes, bags, linen, jewellery, textiles and bric-a-brac related in some way to this....plus more more and more! Below is a little snippet of what was loaded into our car. This photo shows on top, a typically 80s/90s multi pattern wool knit vest in a style that I don't know the name of, but it was used popularly by those sending out a "back to crafty basics of life" message. In very earthy colours of grey green and deep blue, it is so cleverly knitted that it is beyond my understanding of very basic knitting skills. And underneath is one of those other popular jumper knit styles--cable and waffle knit which has seen revivals in the 70s, 80s, 90s and late noughties--hence their popularity now. I really don't think they will ever go out of style by those wanting a natural, hint of country look to their dressing. Again this one is in a quality wool. This is an 80s quality wool longline jacket with a single button and a heraldic embroidered motif to the pocket. Great for that slightly oversize boyfriend blazer look. Good to dress up jeans or with simple black or cream pants and a ruffle front blouse, or small collared blouse--buttoned up to the top of course. Here is a look inside one of my boxes of bags I am bringing. At the top you can see those great beaded bags which were popular in the 60's through the early 70s. Some are drawstring, some are simple totes, some are shoulder bags--but all make you feel good and lead you to handle them. I adore the bright colours and patterns. Who actually sat there and did that? I know I wouldn't have the patience. Maybe some of them were machine done. But all are just as useful now and add a touch of colour and texture to your dressing. So this is not part of what's coming tomorrow but this is Samantha--otherwise known as Sam. She's our little Jack Russell Terrier and had found a great spot in the sun just near the car to warm herself. She looked so comfortable and cosy on the leaf mulch I just had to take a photo. Look out tomorrow night for my photos of the day!! Wentworth Park Collectibles, Vintage and Antiques Fair--Sydney, Australia. So this monthly Fair is on every 1st Sunday of the month as mentioned before hours 9am-3pm with Early Birds allowed in from 8am. Dealers are allowed in from 7am if they hire 3 or more tables and 8am if they hire 2 or 1 table--which is most of us. What happens on entry can be chaotic with dealers rushing in fully loaded and Early Birds trying to buy from those already nearly set up from 7am. In any case there is a buzz and excitement in the air as the anticipation of finding a great treasure or selling a good find to an appreciative buyer grips you. We (hubby and I) were off at 6.30am. The trip is an hour for us through Menangle, Macarthur and down the M5 to Glebe. This morning was frosty but a beautiful sunrise with it. Here is a photo taken driving down our street looking towards the east. Straight across on the other side would be the Wollongong coastline. That 2nd grey line of ridges is not hills as it looks, but clouds. The stark line with the sun rising behind it was so deceiving at first but intensely beautiful. Even the telegraph line looks good in this photo I think. The Wentworth Park Greyhound Track Function Centre is the venue for this Fair. There are at least 140 dealers each month with a smaller downstairs area full as well. It is a great place for a fair--being inside is perfect for collectibles but there is also plenty of parking, flat access, air conditioning, carpet in places, good lighting and food and drink available. The place had a revamp about 8 months ago and now has lovely decor as well with the real treat being.....the pub style carpet gone! Below is a photo of the cafe and food bar. It's looking unpatronised because I took the photo just after they had closed at 2.30. You can buy a good basic range of food and drink there--examples being the usual hamburgers, fish and chips, pies, ice creams as well as bacon and egg rolls, generous sandwiches, a range of cakes and of course coffee, tea, soft drinks and alcohol. There's lots of variety for sale at "Wenty Park", as it's known for short. From pottery to pictures, glass to masks, kitchenalia to garagenalia, clothing, jewellery, shoes, hats, toys, books--it's nearly all there. Most first time visitors are amazed, firstly, at the size of the place, and secondly at the variety for sale. I have had a stall there for over 3 years and it has always been enjoyable and profitable. There is a relaxed social atmosphere and a type of weird feeling of bonding with people who may look and act completely different to you. We are all one in the love and appreciation of old stuff! Below are some photos of what was for sale. This is from my stall. As you can see I have a penchant for selling mushroom things. I'm not real sure why but it could be that I love mushrooms to eat, to look at, I like their shape and curvy lines and my hubby is a trained mycologist ie he specialises in the science of fungi. These canisters are ceramic and were made in Japan in the 60s through the 70s. They are so cute and whimsical--I adore the mushroom shape knobs. I am also amused by a bit of kitsch in the form of figurine shaped planters. This one was obviously meant to be given as a get well gift. Can you believe they made something like this?? A comical hound lying down with a hospital hat and thermometer in mouth with "Get well soon" in relief on the side. This would be from the 60s--a time when society had a slightly offbeat sense of humour I think. So you would put a small plant in there --commonly a cactus or succulent or small fern. I know there are many who collect these planters and I have sold many but today this one stayed there. I thought this picture was interesting too. Ducks were a popular motif for the home in the 50s and 60s. There were flying duck figurines on the wall, table, as dishes and images on crockery and ashtrays. I remember my Mum had a set of 3 flying wall ducks in the dining room. This picture is made of coloured foil on a black background which I think is glass. Just another something different to add to the wall. Across from my stall a lovely lady sells classic vintage and retro clothing/textiles etc. This photo is from her stall. She is always popular with ladies looking for something elegant but a little different. I loved the cardy with the blanket stitch applique. Another lovely lady near me sells an array of retro and oriental decor items. She had a "blue" shelf today of quality pottery and glass. Browns are underrated I think. Imagine this on a big white heavy cloth tablecloth or even on black with splashes of rich blue or green thrown in here and there. The canisters below are from the 70s by the Australian potter John Kemety. He did very good quality work and his pieces are becoming more collectible as time goes by. They are usually signed "Kemety" on the base so are easy to recognise unlike many others. The glass bottle you see is a fridge water bottle maybe from the 60s --but it could even be the 50s. The ridged and rippled glass is typical of that post deco era. The lid has a flip opening spout. There is also a white and brown folk motive salt canister--I have attached a salt canister to the wall for holding elastic bands at arms reach. I hardly use salt but I like the look of it on the wall. I find it hard to believe how much salt was used in everyday cooking prior to our little health revolution in the 80s, that these were stocked full. It's ironic that we stopped using salt in home cooking, but over consume it in general processed and takeaway foods. I hope these photos give you a bit of an idea about this great Fair and a hint of what's for sale, and why so many love it all. It is still undiscovered by so so many lovers of Vintage. I have not heard a negative about it yet from a new shopper or collector and once discovered many just keep coming back for that something different to put on the table, to cook with, to decorate with and just to enjoy. I am in love with these shoes and this bag. I adore quality leather that exudes richness of colour, strength, suppleness and the ability to show patina in an appealing way. I think it's harder to find this type of leather today. I see something in them that still has us connected to centuries ago. This is what I hunt for--a taste of that rock solid connection with the earth and sustainability...hmmm.....but they are for sale. They will be at Mitchell Road Design Gallery tomorrow or Monday. Those shoes have such a rich chocolate colour, don't they? Their shape is cute and a bit funky too and there is a hint of olde worlde to them--1880s, 1820s? Ok, so that's a big time difference but you get the drift. Actually I am having thoughts of Australian convict shoes by their simple shape, rounded toe and leather type, although I am sure the leather of convict shoes would have been much hardier, and the sole would have been leather as well. A hunt for convict shoe images revealed very little so I can't confirm my gut feelings. I have seen similar shoes referred to as "Prairie Shoes" on eBay--quite apt really--just that we don't have prairies here--I s'pose we call them plains. They are by Candy. I've been reading that Candy started in 1961--so that's nearly 50 years ago. I was surprised. I remember them as a 70s/80s "down to earth on the cheaper side" brand. However when I look at these I see quality and comfort, which is not what many cheaper brands are about in the noughties. These shoes were worn and scuffed when I found them but after a clean and polish they look rich and have just the right amount patina. They have many years of life left yet. This bag is by Martino. I'm guessing 80s/90s era as it doesn't have a mobile phone pocket and the lining is not synthetic. The leather drawstring bucket shape has long been a favourite of mine cause it looks good and is practical. This bag is roomy and stands well on a wide base. The rich caramel colour of the strong but supple leather is just lovely. I find these sort of colours calming--maybe because they remind me of food! We have 2 large Queensland Silver Wattle trees. They have been flowering for about 2 weeks and are amazing in their richness of colour and the fact they flower so early. In the middle of winter when it's frosty, freezing and short on daylength they are a source of brightness to the day and great uplift to the spirit as you walk out to the car in the morning feeling tired and that 1 degree bite to your body. Not much flowers this time of year but they are one of them. These wattles have silvery grey leaves (really not leaves but phyllodes) and bunches of small soft fluffy butter yellow flowers about 8-10 mm in diameter. The scent they emit is delightfully honey-like and you can smell it a long way off. The flower stems look great in a vase by themselves or amongst other native flowers if there's something else flowering such as Grevilleas or Thryptomeme, but the smell can be overpowering in the home and I take the vase outside for the night. Unfortunately they are invasive and classed a weed in many areas, and we really shouldn't have them....but I figure on our acres the place is so changed from the original vegetation it doesn't matter too much. Anyway they are a source of food for the native birds and insects so that's a good reason to leave them. Tomorrow I will be getting ready for the monthly Sydney Collectibles, Vintage and Antiques Fair at Wentworth Park Greyhound Function Centre in Glebe on Sunday. I have had a stall there for about 3 and a half years now. "Early bird"s are allowed in with dealers at 8am. Entry costs: $5. $10 for early birds for the privilege of catching all the bargains and best pieces. There are 2 eateries there and coffee and alcohol is sold also so it is a great day out. An incredible amount of stuff is for sale there and almost anything goes except probably large pieces of furniture. So to find something completely different to what your friends have this is the place to come! Spotted last month was Glen McGrath and family. You can sometimes spot the odd celebrity there. I will post photos of the day on Sunday. DOWN TO EARTH VINTAGE. Vintage and retro everything....and giving everything a second chance. Hi. I am passionate about recycling--making the most of what we already have spent time, money and energy making. Selling vintage and retro collectibles, decor items, fashion and textiles is how I make my living. Check out downtoearthvintage. I do believe the slump in new retail sales is just the beginning of the People's conscience giving them a new personal energy, sensuality and release of creativity they never had before. Australian birds, animals and plants are my other love. I hope that all citizens of the world value their own country's nature unconditionally, as once it's gone we cannot bring it back.